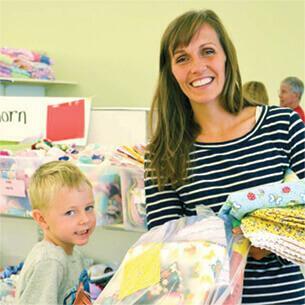 Planning a birthday celebration or other special occasion? We know how daunting party to-dos can be. You’ve got a guest list to plan for and entertainment to line up—not to mention the hunt for themed décor and all that goes along with it. Don’t fret! 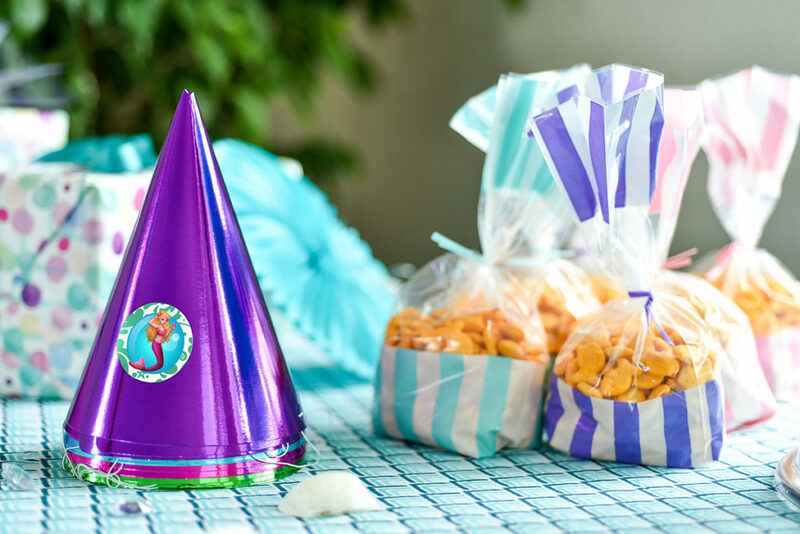 One easy way to simplify the swag (and the budget) is by dressing up a few solid-colored items with mermaid party printables. Read on to learn how you can add a little flair to your party décor in a snap! Add a touch of regality to your party hats, favors, and whatever else you can dream up with our easy, downloadable sticker template! Featuring a sea of images showcasing Fin Fun’s Mermaidens princesses, our whimsical designs are sure to awaken the magic of mermaiding at your next party gathering! 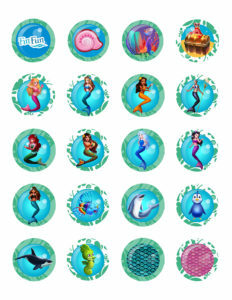 Download your FREE Fin Fun Mermaidens 1.5” stickers and print them on AVERY Template 8293. Planning party favors where snacks reign supreme? Search for solid-colored cellophane or paper bags to hold snack-related items. These are easily found at most shopping centers, but you can really save a buck by shopping at your local dollar store. Fill them with fish crackers, candies, popcorn or ocean-themed gummies for convenient snacking. Kids love chewing on candies shaped like sea critters and mermaids! You can easily adhere stickers to these goodie bags for an extra element of whimsy. 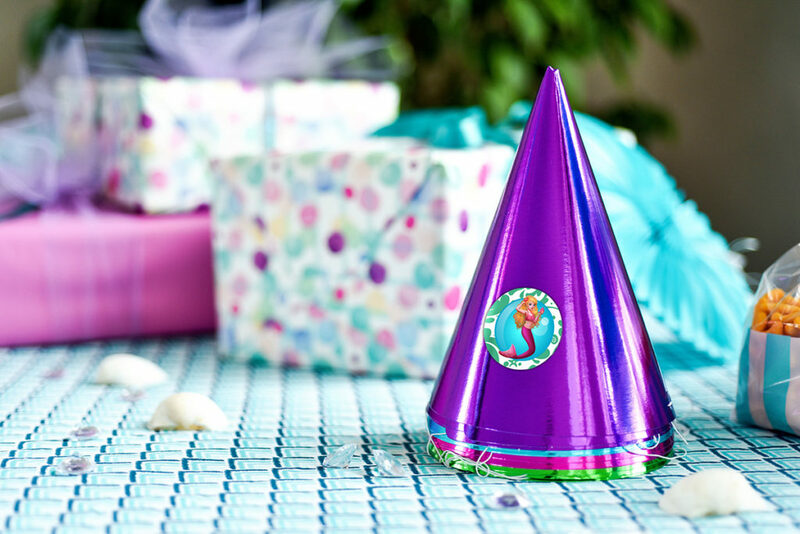 Check out these printable straw-toppers that add a beachy touch to any party drink! Power up the princesses by giving them something easy to do with our printable (and FREE) mermaid crowns! 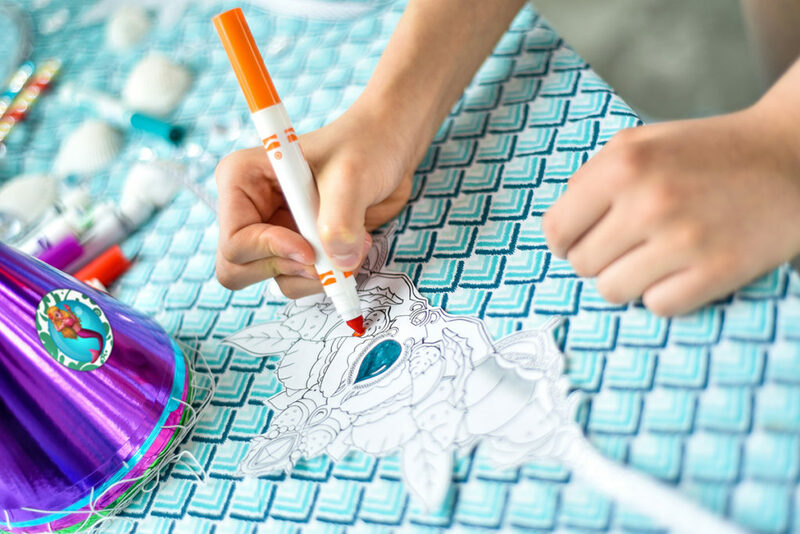 Set up an art table where kids can sit and color to their heart’s content—then watch their artistic abilities come to life! Be prepared with a tray of coloring options for kids to use. Think markers, crayons, paints, glitter, stamps—the possibilities are endless when it comes to creating a one-of-a-kind design fit for mermaid royalty. Download your FREE mermaid crown now for a quick and easy party activity. 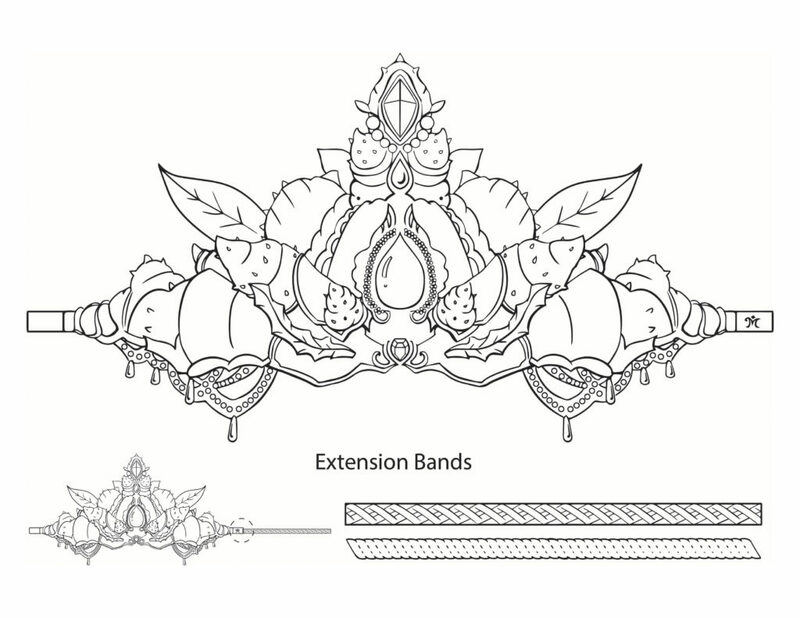 To make this paper crown wearable, secure the extension bands with tape or staples. You can even print this template out on thicker paper for a more durable design that will last throughout the event! Looking for extra game ideas to fill the time? 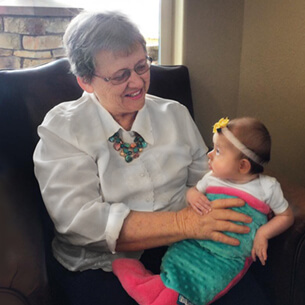 You’ll love Fin Fun’s exclusive Pin the Tail on the Mermaid game! It’s FREE and printable! All you need is a standard-sized poster board (dollar store, anyone?) for the background and letter-sized paper for printing the cutouts. 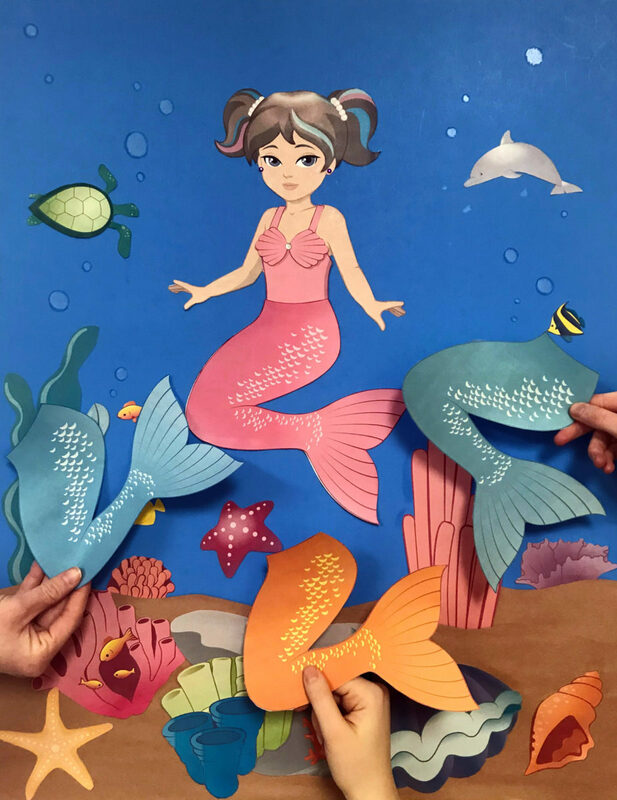 Cut each design element from our downloadable sheets, then adhere to the poster board for a stellar DIY look that’ll excite all the little mermaids at your party! Want to add a splash of whimsy? Add to the 3D look by pasting two sheets of brown construction paper cut into the shape of a rolling sand floor at the bottom of your poster board. 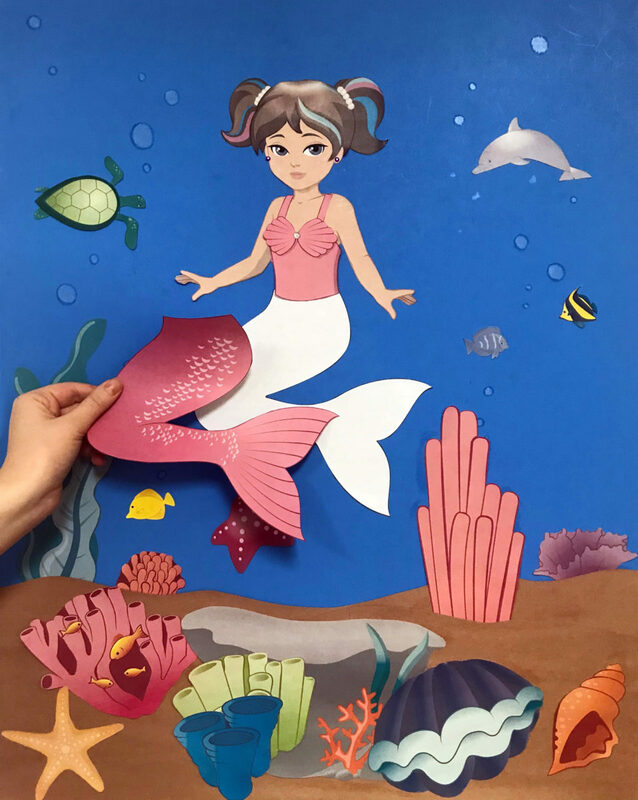 Our printable mermaid cutouts include eight different mermaid tail colors to choose from! You can even select your favorite hairstyle, swimsuit top, accessories, & more in this PDF game pack! 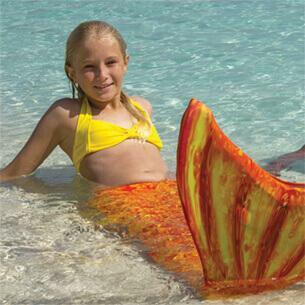 Download the Pin the Tail on the Mermaid PDF now! We’d love to see how your party turns out! If you’re looking for extra game ideas to fill the time, check out this stellar list of mermaid party games! Tell us how your party turned out in the comments below! 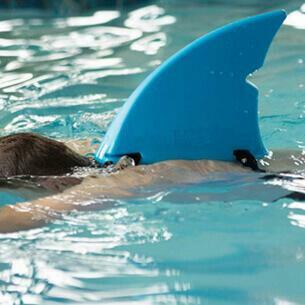 How to Throw a Shark Extravaganza! I adore the pin the tail on the mermaid game! Darling!